Fox News host Megyn Kelly laid into Donald Trump for his escalating attacks on the judge presiding over two fraud lawsuits involving Trump University. 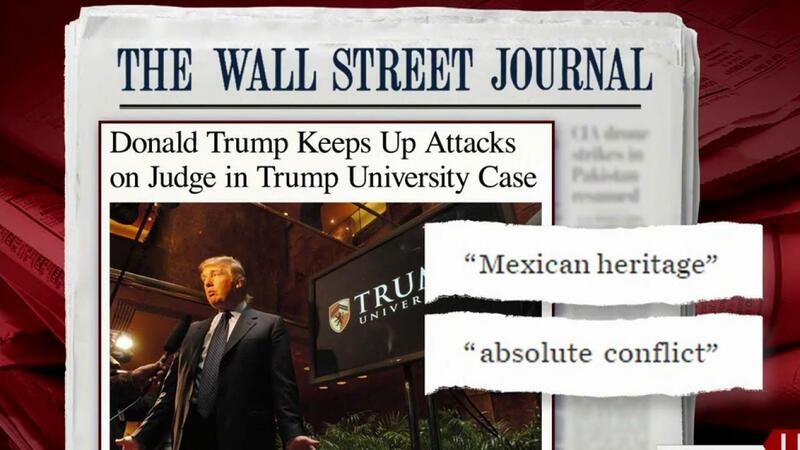 In an interview with The Wall Street Journal published Thursday, the presumptive Republican presidential nominee said US District Judge Gonzalo Curiel had" an absolute conflict" in presiding over the civil cases against Trump University because Curiel was "of Mexican heritage," as Trump put it, and belonged to a Latino lawyers association. Trump said Curiel's ethnic background creates an "inherent conflict of interest" because Trump has promised to build a wall along the Mexican border and deport immigrants who are in the country illegally. Kelly brought Bill Bennett, a former US secretary of education with a degree from Harvard Law School, on the show to discuss Trump's attacks on the judge. But the segment turned into mostly an extended riff from Kelly, a former attorney. "I'm a journalist here at Fox News and I've been doing legal commentary here for 10 years," Kelly said. "This is out of line." Bennett agreed, calling Trump's comments "unfortunate," and Kelly continued. "First of all, people are saying that this judge is a member of La Raza, the group that's been protesting Donald Trump," Kelly said. "He isn't. He's a member of a Hispanic lawyers' association that has no partisan stripes whatsoever. They support Hispanic lawyers and judges. That's it." Kelly also slammed Trump and his supporters for referring to Curiel's Mexican heritage. "Secondly, the man is not Mexican," Kelly said. "... He's American. His parents are Mexican, he's of Mexican heritage. He was born in Indiana." She also shot down the notion that Curiel might have a conflict of interest in Trump's case. "Third, he has no conflict of interest," Kelly said. "Now Donald Trump is saying the judge needs to be investigated, someone should look into him, just because he's ruled against Donald Trump in this litigation repeatedly." "That doesn't make you biased!" Kelly said. "It doesn't." Earlier this week, Curiel ruled to unseal documents in the Trump University case, including sales and marketing "playbooks" from 2007 through 2010 that advised instructors on how to sell the courses to students. Kelly said she'd planned on talking about House Speaker Paul Ryan's endorsement of Trump on her show until the news broke that "Trump continues to attack a ... sitting federal judge, who, by the way, did a lot to fight the judge cartels when he was a prosecutor." "'A Hispanic cannot judge a case against me.' That is what Trump is saying," Kelly said. "... And let me tell you, when he does this, I guarantee you right now, that this judge is getting threats and vitriol and who knows what else." Kelly aired a clip of her recent interview with Trump during which she asked him if he considers the effect his messaging has on people. "Now he's out saying this judge is a total disgrace, that they ought to look into him, and he's on the precipice of becoming the president of the United States," Kelly said.